Innocence Ends. Nice short, sweet tagline. And that face - those eyes! Oh my, Mia Wasikowska, this looks wonderful. Maybe I'm a little swept away, but this is still a good poster for Park Chan-wook's Stoker, his funky new mysterious drama starring the lovely Mia Wasikowska, who gets a head shot on this one, as well as Matthew Goode and Nicole Kidman, not seen. The image actually subtly blends some of the beautiful artistic hand-drawn one-sheet debuted a month ago into the lower half of the design, along with Mia's face. Brad Brevet says the poster "Stares into Your Soul", which is a bit true. I'm still looking forward to seeing it. There's also a featurette about the making of the artwork on the first poster, for those interested watch here. After India's (Mia Wasikowska) father dies in an auto accident, her Uncle Charlie (Matthew Goode), who she never knew existed, comes to live with her and her emotionally unstable mother Evelyn (Nicole Kidman). Soon after his arrival, she comes to suspect this mysterious, charming man has ulterior motives, but instead of feeling outrage or horror, this friendless girl becomes increasingly infatuated with him. 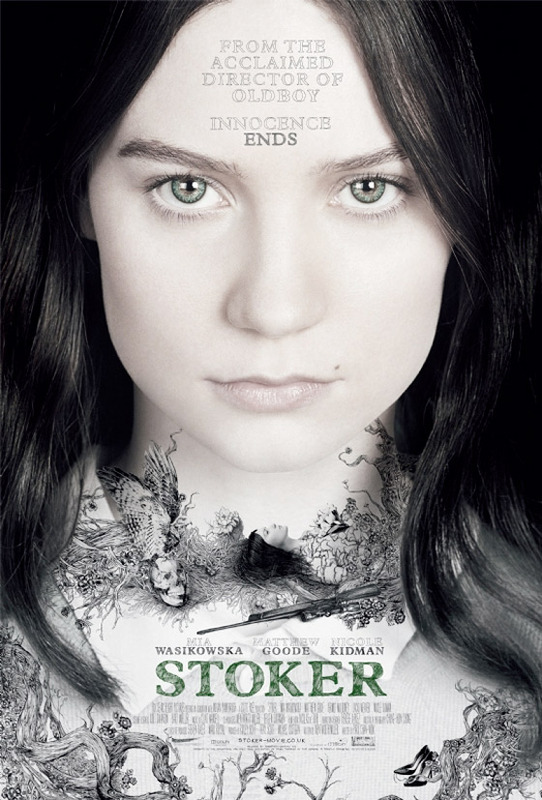 Park Chan-wook (Oldboy, Vengeance Trilogy) directs Stoker from a screenplay by actor Wentworth Miller going as Ted Foulke. Fox Searchlight is releasing Stoker in theaters March 1st, 2013 this spring. See the trailer. it would be better, if it not on her forehead. I completely agree, but if you were a designer with a marketing group pressuring you for that wording to be put in there then where else could it go? yea its hard lol esp since so many words, i could maybe imagine "Innocence ends" over the entire face, transparent but where the fk would "FRO THE ACCLAIMED DIRECTOR OF OLD BOY" go.. LOL. I like the muted color of the poster, and I still have no idea what this movie is about really. That's the beauty of it.